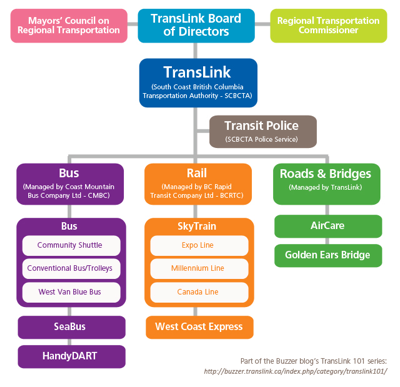 The Buzzer blog has a nice link: » TransLink 101: What is TransLink, anyway? TransLink is the multi-modal transportation organization for Greater Vancouver, BC, and it is unlike what we see in the States. It is in fact, closer to the idea described in Enterprising Roads, a transportation utility with autonomy constrained by oversight. One of the key points to consider is that metropolitan Vancouver has a transit mode share of 21%, comparable with much larger Toronto and Montreal (though behind metro New York’s 30%, it is well ahead of Seattle’s 9%), despite ranking 34th in population. Some of that has to do with institutional factors and governance. The province agreed to provide six cents of tax room from the provincial fuel tax, which would be a major funding source, and also give the GVTA the parking sales tax revenue. The GVTA would have the ability to generate a steady stream of revenue through levying taxes; however, any increase in taxes would have to first be approved by the GVRD board. The only increase the GVTA could implement on its own was to transit fares. Canada should consider exporting this model of governance to the US.